Multiple sclerosis (MS) is a chronic inflammatory disease in which the myelin sheath on the nerve endings gets inflamed and damaged. This leads to scarring of the neurological tissue in the brain and spinal cord. While the medical model has very little support, many individuals have found ways to beat multiple sclerosis with natural lifestyle strategies. In this article, you will discover 21 strategies to treat multiple sclerosis naturally. MS is a condition in which the body’s own immune system attacks the fatty myelin sheaths that insulate nerve tissue. This results in scar tissue plaques that disrupt neurological signals throughout the body. MS actually means multiple scars/plaques/lesions. One of the major areas that is affected is the white matter of the brain and spinal cord which is mostly myelin (1). Multiple sclerosis affects approximately 400,000 people in the United States alone, and 2.5 million worldwide, most of them being young adults. It expresses itself in four clinical forms: relapsing remitting MS (RRMS), secondary progressive MS (SPMS), primary progressive MS (PPMS), and progressive relapsing MD (PRMS). Approximately 87% of patients present with RRMS, characterized by acute attacks (relapses) followed by partial or full recovery (remission). Patients can manifest with a heterogeneous group of symptoms including changes in vision (unilateral visual loss, diplopia), weakness, dyscoordination, sensory loss or distortions, or changes in bowel and bladder function (1, 2). Less diagnostic but also disabling symptoms include cognitive change, fatigue and mood disturbance. Progression of disease may eventually lead to severe disability. Life expectancy is 5 – 10 years less than the normal population. The MS disease is characterized by chronic inflammation within the nervous system. It is believed to be an auto-immune disease where the T lymphocytes attack the protective sheath (the myelin sheath) around the white areas of the brain including the brain stem, optic nerve, basal ganglia and spinal cord (3, 4). The white matter functions to carry signals between the gray matter regions, where the major processing is done and the rest of the body. When the myelin is lost the neuron can no longer effectively conduct electrical signals. The major cells that form the myelin are called oligodendrocytes (OD). The body tries to remyelinate in the early phases of the disease but is unable to because the OD cells are under constant immune attack. As the OG cell numbers go up, the immune system in the brain which is controlled by the microglia cells becomes more active and this results in an aggravation of the MS process. This is called glial activation and upon repeated destruction of the OG cells and myelin sheath this process leads to scar-like plaques that developed around the damaged neurons (5). Additionally, MS is characterized by a breakdown in the blood brain barrier (which protects the brain from toxins, infectious microorganisms and our own immune system) and T lymphcytes which are normally unable to cross the blood brain barrier are able to enter into the neurological tissue. These T lymphocytes agitate more inflammatory mechanisms and promote swelling and further tissue destruction. 2. Low Vitamin D Levels: Individuals with low vitamin D3 levels (below 40 ng/ml) are at significant risk for developing chronic inflammation and auto-immunity (6). 3. Gut Dysbiosis: Poor microbial balance in the gut microbiome leads to leaky gut syndrome and chronic inflammation (7). The gut must be addressed in order to get well. 4. Mitochondrial Dysfunction: The mitochondria are the energy producing organelles in each cell of the body. They are extremely key in the bodies ability to handle oxidative stress. Dysfunction in the mitochondria leads to increased free radical and oxidative stress which creates immune alterations. Many researchers believe that multiple sclerosis is primarily a mitochondrial disease (8). 5. Low Glutathione Levels: Glutathione is the major anti-oxidant within every cell of the body. It is critical for white blood cell (WBC) function as the WBC’s encounter tremendous amounts of free radical and oxidative stress every second of the day. Low glutathione leads to chronic inflammation and often to auto-immunity (9). 6. Poor Omega 6:3 ratio: The average person has significantly more omega 6 fats than omega 3 fats. The increased omega 6 stimulate the release of pro-inflammatory mediating prostaglandin molecules. This is a key factor in the development of chronic inflammation and auto-immunity (10). 7. Upper Cervical Subluxation: The bottom of the skull (occiput) and the first bone (atlas) play a significant role in the coordination patterns of the brain and immune system. Dysfunction at this joint torques and compresses the top of the spinal cord and increases inflammatory activity in the body (11). 8. Environmental Toxins: Exposure to high levels of infectious microbes, environmental chemicals such as plasticizers, pesticides, herbicides, personal care products, heavy metals and biotoxins such as mold wear down the bodies glutathione levels, alter the gut microflora and increase inflammatory activity in the body (12, 13, 14). 9. High Stress and Poor Breathing Habits: High mental and emotional stress increases stress hormone production which induces inflammatory activity within the body. Short and shallow breathing habits can simulate chronic mental and emotional stressors on the physiological level (15). 10. Lack of Sleep: Poor sleep promotes immune dysfunction and increased inflammation. Good sleeping habits and optimal melatonin secretion reduce inflammation and promote improved tissue healing (16). 11. Methylation: Methylation is a key process that protects DNA, turns on and off genetic traits and helps to detoxify environmental chemicals. Many individuals have certain genetic polymorphisms that limit their ability to appropriately methylate. Methylation plays a very important role in T cell function and poor methylation status is associated with the development of auto-immunity (17). 12. EMF Exposure: Electromagnetic frequency exposure has been shown to alter the function of the immune system and increase one’s susceptability to developing an auto-immune condition (18) I will touch on a few of these key areas and how they relate to MS in this article. Blood sugar balance is critical for sustained energy production and immune control throughout the body. When our blood sugar gets too high (hyperglycemia) the sugar molecules bind to proteins in the body and create Advanced Glycolytic Enzymes (AGEs). The AGEs destroy cell membrane function and damage insulin receptor activity creating a vicious cycle of elevated blood sugar and inflammatory stress. AGEs cause massive destruction throughout the body and have an affinity for neurological tissue. One of the major epidemiological factors associated with MS is its striking difference in number of cases based on geography and climate (21). Those living close to the equator have significantly lower risk of MS. This is due to the beneficial effects of regular sun exposure and vitamin D intake in modulating healthy immune responses. In the Northern hemisphere, most people have increased vitamin D3 levels in the fall after a full summer of increased UV light exposure. January –April are usually when the lowest levels are reached. Multiple studies have shown that more individuals who develop MS and other auto-immune related conditions are born in May/June than in October/November (22, 23). This would indicate that low motherly D3 levels lead to developmental and maladaptive immunological responses in the child. D3 levels should be between 60-100 ng/ml for optimal immunological expression. There has been a tremendous amount of research linking the gut microbiome and neurological health. Research has indicated that low levels of healthy lactobacillus and bifidobacterium are linked with increased brain and nervous system excitability and neurological inflammation (24, 25). Studies are revealing how diverse forms of neuro-immune and neuro-psychiatric disorders are correlated with or modulated by variations of microbiome, microbiota-derived products and exogenous antibiotics and probiotics. The microbiome helps to prime and balance the immune system and unfavorable alterations increase the susceptability for autoimmune diseases such as multiple sclerosis (26, 27). When the microbiome is dysregulated it often leads to a damaged gut lining and intestinal permeability. This is found in the pathogenesis of mutiple sclerosis and other auto-immune diseases (28, 29). 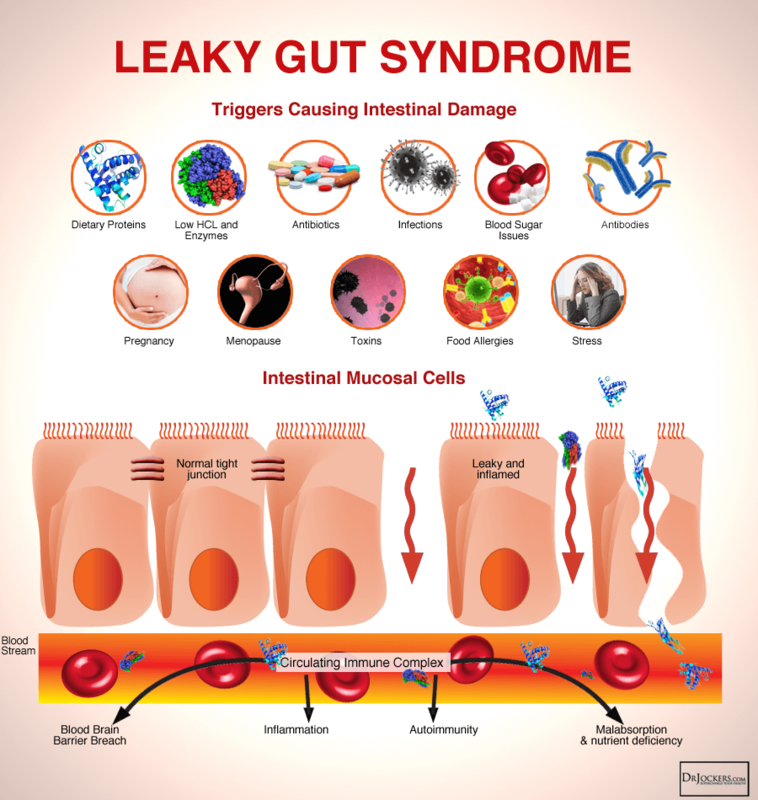 This “leaky gut” causes undigested food particles to pass into the bloodstream where they are tagged by the immune system and attacked with massive inflammatory processes that have the ability to affect nearly every system in the body. This creates a food allergy or sensitivity that the body reacts to whenever it is exposed. The most common food based culprits include all processed foods, artificial sweeteners/preservatives and gluten containing products. Soy, peanuts, pasteurized dairy, corn and eggs are often not tolerated well. The nightshade family of eggplant, potatoes and tomatoes are often challenging on the system as well. Mitochondria are one of the main cellular sources of reactive oxygen species (ROS) and reactive nitrogen species (RNS) and play a pivotal role in many neuro-pathological conditions. Mitochondrial dysfunction leading to excessive production of ROS and RNS plays a significant role in the pathogenesis of MS, particularly in loss of myelin/oligodendrocyte complex (30, 31). Supporting the mitochondria with clinically effective doses of mitochondrial nutrients such as CoQ10, L-carnitine, N-acetyl cysteine and lipoic acid has been shown to be extremely effective for improving mitochondrial health and MS (32, 33, 34). In multiple sclerosis, the cells are under so much stress that there main protective shield, glutathione (GSH) gets worn down and oxidative stress damages the mitochondria and the DNA leading to cell death. Poor blood sugar control and high environmental toxin exposure are known to deplete glutathione levels and impair mitochondrial function (35, 36). A key pathway that maintains cellular glutathione levels and the ability of the cell to adapt to stress is called Keap1-Nrf2. When this pathway breaks down it causes increased levels of oxidative stress within the cell that leads to the glutathione depletion and mitochondrial dysfunction (37). Upper cervical subluxation leads to increased states of pain, fatigue, anxiety and accelerated stress as well as mal-coordinated immunity (39). Well trained chiropractors can analyze these regions of the spine and give specific corrective adjustments to restore balance and optimal neurological expression in these regions. This reduces the stress response and improves endorphin release. This improves the individual’s pain levels, stress tolerance, immune function and overall well-being (40). Here are the best action steps to get started with on your journey to prevent and/or beat Multiple Sclerosis. You should always consult with your physician before stopping or changing medications or taking on new health strategies. Additionally, you should be working with a functional health practitioner to help guide you through these strategies. This is not an exhaustive list and there are other natural therapeutic strategies that I and functional health practitioners will utilize to help individuals with Multiple Sclerosis. 10) Supplement With Omega 3’s: Omega 3 fatty acids and in particular the long chain variety EPA and DHA are critical for stabilizing blood sugar, reducing inflammation and pain. Consume grass-fed meat, grass-fed butter, wild-caught fish and spirulina to get it in your diet. It is also advisable to supplement with 2-5 grams daily of EPA/DHA along with 200 mg of GLA. Clinically, I use ProEFA to boost up omega 3’s. 11) Improve Your Mitochondria: The mitochondria are the energy powerhouses of every cell. When someone has MS it is a clinical sign that they have dysfunctional activity going on in the mitochondria. Support your mitochondria with clinical doses of CoQ10, L-carnitine, N-acetyl cysteine and Lipoic acid. The supplement I use with my neurodegenerative clients is Brain Supercharge which has the clinically effective dosages of each of these key nutrients and more. 14) Intermittent Fasting: Going 16 hours between dinner and breakfast is one of the best ways to improve mitochondrial production. Your body improves energy efficiency by increasing and strengthening the mitochondria during periods of fasting. This is also one of the best ways to reduce oxidative stress and inflammation. Consume your meals in an 8 hour window such as 11am – 7pm. Read this article for more info on fasting. 18) Use Essential Oils: The anti-oxidant content and aromatherapy benefits of essential oils help to improve oxygenation and reduce the harmful effects of oxidative stress throughout the body. Some of my favorites include lavendar,peppermint, chamomile and sweet orange among others. Put a drop on your hands and mix together and then cover your nose and inhale the healing vapors. This will stimulate your brain and increase blood flow to your cranium. 1. Loma I, Heyman R. Multiple Sclerosis: Pathogenesis and Treatment. Current Neuropharmacology. 2011;9(3):409-416. 8. Mao P, Reddy PH. Is multiple sclerosis a mitochondrial disease? Biochimica et biophysica acta. 2010;1802(1):66-79. 14. Ercolini AM, Miller SD. The role of infections in autoimmune disease. Clinical and Experimental Immunology. 2009;155(1):1-15. 24. Bhattacharjee S, Lukiw WJ. Alzheimer’s disease and the microbiome. Frontiers in Cellular Neuroscience. 2013;7:153. 25. Hill JM, Bhattacharjee S, Pogue AI, Lukiw WJ. The Gastrointestinal Tract Microbiome and Potential Link to Alzheimer’s Disease. Frontiers in Neurology. 2014;5:43. 37. Harvey CJ, Thimmulappa RK, Singh A, et al. Nrf2-regulated glutathione recycling independent of biosynthesis is critical for cell survival during oxidative stress. Free radical biology & medicine. 2009;46(4):443-453. Wonderful information on MS. Yes, I completely agree to go for the measures suggested by you before going to stem cells therapy ( which is expensive & with complications). Conventional medicine is total failure here. Dear Dr. Cannell,I am shaking with exnciemett as I read your blog today! I had autoimmune myelitis attack in 2007. I kept pushing and pushing for the why as I demanded every test in the book. It was only when a forward thinking rheumatologist decided to run my D level 17. This was back before anyone in the mainstream media had begun to pay attention to D. Thank you for the amazing work you do. Please keep the momentum going.Forever Grateful! Thanks for sharing Margaret! Praise the Lord for your recovery! !